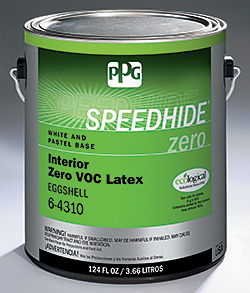 Speedhide zero low odor interior paint contains no ethylene glycol and zero VOCs in the base. Recommended for use on drywall, plaster, masonry, wood and metal surfaces. Available in primer, flat, eggshell and semi-gloss finishes in a variety of bases. Complies with Greenguard Environmental Institute emissions standards.